Not at all coincidentally, Zionism and the modern, emancipated, assimilated JINOs (Jews In Name Only) were born at the same time and in the same place. In fact, they are twins. Ever since Napoleon’s European blitz of the first decade of the 19th century, Western Europe, especially on the continent, has been shedding its feudal ways and adopting laws that treated everyone equally, regardless of ethnic or religious origin. Especially in the principalities that made up what today is Germany and in the heartlands of the Austro-Hungarian Empire, today’s Austria and Hungary, this process was kind to the indigenous Jewish populations. Centuries-old ghettos were opened up and their denizens, blinking like people who have are seeing sunlight for the first time in a long time emerged into the public square. They emerged with few worldly possessions, but they had something better. Total literacy and analytical skills honed by many centuries of studying Jewish law, the Talmud. These Jews took by storm every university in Middle Europe. 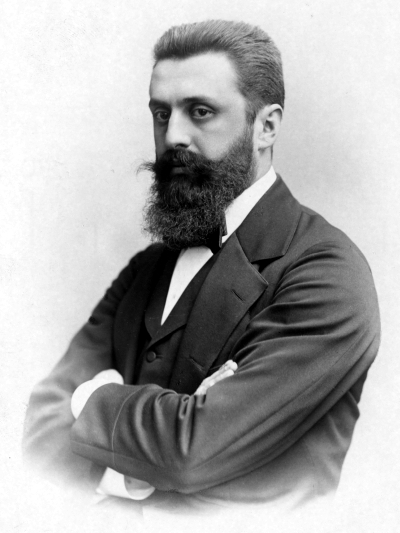 From their ranks came Freud and Einstein and the founder of Zionism, Theodor Herzl. However, the process of liberalization and emancipation did not penetrate the bastions of feudalism that were never occupied, however briefly, by the forward thinking Frenchman of short stature. The Ottoman empire, with its vast territories in the Balkans and southeastern Europe and the Russian Empire in which by far the largest part of the world’s Jewish population then resided remained staunchly conservative, giving their Jewry no outlet for its creative abilities, no way to get ahead in the world. This gave rise to the so-called “Jewish Question”. The question was simple: In Eastern Europe, from the shores of the Baltic Sea to the shores of the Mediterranean, there lived millions upon millions of totally unassimilated Jews. Jews who were poor, who wore different clothes form their Gentile neighbors, who more often than not spoke a different language, had different names, and whose traditional professions of small-time loan sharking and trades like tailoring and shoe making were already obsolete, taken over by large banks and mass-produced factory goods. These Jews competed with Gentiles for meager resources along the periphery of dying empires, which inevitably led to conflicts known as pogroms. The rich Jewish elites just a few hundred miles to the West looked on their Eastern European brethren with no less disdain and disgust than the Gentiles did. They wanted nothing to do with them. They were ashamed of them. Since last names are difficult to change, they started giving their children Gentile names like “Albert” and “Theodore” instead of “Baruch” and “Shim’on”, a practice that continues in America today, where most Jews are “Scotts” and “Glenns”. If the Jewish masses in Eastern Europe were to be genocided out of existence, the assimilated German and Austrian Jewry didn’t much care. Except one guy, an Austrian journalist by the name of Theodor Herzl, who almost singlehandedly created, nursed to life, and funded the Zionist movement. Zionism allowed young and daring Jewish youths from the Russian Empire to emigrate to what was then the Ottoman province of Syria, the southern tip of which was a small sliver of nearly uninhabited and barren land that is known today as Israel. Herzl, a genius fundraiser, funded the Zionist project in part by charity and in part by venture capital. Both came from extremely rich European Jewish families like the Rothschilds, but some was crowd sourced by regular Jews in Europe and even in America. Being able to give money to the Jewish pioneers sweating it out in malaria infested swamps during the day and standing guard against Arab raids at night assuaged the conscience of many an Austrian, German, and American Jew. Vineyards that today produce excellent award winning Israeli wines were started with Eastern European Jewish muscle and Middle European Jewish money. And then came the Holocaust. The Nazi Germans had no interest in hearing the pleas of the German and Austrian Jews that they were in fact Jews by religion only and since they were not even religious, they were really not Jews at all. They were all slaughtered anyway. Today, American Jews want one thing and one thing only. To be the kind of 99% assimilated JINO’s that the German and Austrian Jews were a century ago. They want to have their cake and eat it too. They want to boast about their Jewishness and maintain a network of private schools with names like like Solomon Schechter and private clubs like the Jewish Community Centers that exist in any American city above a certain size, but they also want their Jewishness to be invisible when it comes to their professional and public lives. And to be honest, they almost pulled it off. Almost. Why not completely? What is standing in the way of the American Jewry’s “assimilation on our own terms” nirvana? Israel, that’s what. Israel is now economically self-sufficient and fully capable of defending itself. With half the world Jews living in Israel, almost seven million people, it is also demographically secure. With its nuclear triad, Israel is capable of delivering a nuclear strike form air, sea, and land to any point on the globe. Countries that have that kind of capability do not perish from the earth. And what is that brand, the Israeli and by extension Jewish brand? It is brash, honest, sometimes brutally so. It is militant, forceful, armed to the teeth. It is “don’t mess with me unless you want to be shot on the spot” kind of brand. It is unequivocally, unambiguously nationalist, because the Zionist movement is the self-determination movement of the Jewish nation. It puts the maintenance and the defense of Jewishness above any other consideration, including human rights, equality, and democracy. The Israeli brand is a wild secular success; startups, exits, consumerism and unbridled consumption. It is also Orthodox Judaism, a truly Orthodox Judaism that doesn’t need to be qualified as “Orthodox”, because it does not even for a moment allow or accept the existence of any other Judaism such as Conservative or Reformed. This brand, the new Jewish brand that was created by Israel and by Israelis is repulsive to 70% of American Jews. They reject all of its components separately and the brand in its entirety. These 70% worship diversity and inclusion, whereas Israel is nationalistic and exclusionary. They reject nation states whereas Israel is the quintessential nation state by definition. They reject borders, while Israel enforces its own with extreme prejudice. They practice, if anything, the 19th century made in America Judaism-lite “religions” of Reformed and Conservative Judaism. Israel does not recognize “rabbis” from these religions and hence it does not recognize the marriages and conversions that are performed by them. Israel is the poster child for all that is most hated by progressive globalists. Seventy percent of American Jews are progressive globalists. And yet, against their will, by virtue of the last names, by virtue of their birth, they are lumped together with these neanderthal people, these throwbacks to the dark ages, Israelis. American parties have names that have never meant anything. What they stand for changes with the times. Today, the Democratic Party is the party of progressive globalists and the Republican Party is split. It’s Never Trump wing is on its way to join the Democrats and those who remain belong to a nationalist party. America First! To quote the first national American president in a long time, Trump. It is natural for a nationalist party to align itself with the quintessentially nationalist Israel. It is equally natural for a rabidly progressive, globalist, and anti-nationalist Democratic party to distance itself from Israel. A funny and very telling scene unfolded on the Fox News show “Outnumbered” when Israeli PM Netanyahu was having a love-fest with President Trump in the Oval Office after Trump recognized the Golan Heights as part of Israel. The very Jewish commentator Jessica Tarlov, immediately after the Oval Office segment was over called Trump an anti-Semite. African American Harris Faulkner’s two-inch fake eyelashes flew up with such a force that a hurricane in Brazil seemed all but inevitable. “After all of THIS, you call him an anti-Semite?? ?” she said (paraphrasing). “But Charlottesville,” said the Jewess Jessica. Seventy percent of American Jews hate what Israel has become. They hate that its doesn’t need them anymore. They hate that it is becoming less and less secular and more and more traditional. They hate it because it is less and less Ashkenazi. They hate it because it loves guns and guns are everywhere in Israel, including the dreaded black ones. They hate it because it is not progressive, or liberal, or inclusive, or diverse. Most of all though, they hate it because it is Israel that owns the global Jewish brand. Because seventy percent of American Jews hate Israel, the fact that the Republican party today is all in for Israel makes them hate the Republicans more, not less. And because the Democratic Party is now rabidly anti-Israel, it makes them love it more, not less. But here we come to an interesting point. Just like the Germans in 1933 made no distinction between the perfect German speaking and fully assimilated German Jews and the Yiddish-speaking, unassimilated Polish Jews, the Democratic Party today with its strong Jihad membership makes no difference between a “Scott Goldstein” a devoted Democratic voter and a “Gal Tzan’ani”, an Israeli soldier whose grandparents came back to their historic homeland from Yemen in the 1950’s. To the Ilhan Omars and Rashida Tlaibs of this world, just like to the Adolph Eichmanns, they are all Jews and they all deserve to die. Like any natural phenomenon, American Jewry is split, but the split is gradual. There is a small, but important center. This center is fast melting though under the twin blazing suns of the Democratic hatred for Israel and the Jews and the Republican love for them. The fact that no Democrat under the age of 70 bothered to address the AIPAC conference last week speaks volumes where the Democratic Party is headed. Ilhan Omar’s rebuke of Speaker Pelosi for her stance against BDS, a rebuke that remained unpunished, speaks even more. Breitbart is reporting that Obama’s anti-Israeli ardor was cooled somewhat by Jewish donors. It is hard to see these donors opening their checkbooks to any of the Democratic candidates currently in the race. Republicans should continue their support for Israel because it is a good policy for America and they should continue to make their case to the American Jewry. Since most American Jews are few and most live in non-competitive liberal districts and states (except Florida), it is their money that speaks loudest. And this money is not on the fringes; it is in the center, it is held by people who have contributed much to Israel and have been lavishly honored for doing so. They do have a connection to Israel. Many own real estate there. Many more are invested in Israeli startups. These people should be encouraged to quietly, incrementally, unnoticeably yet firmly close their checkbooks to the Democrats. That may prove to be the most patriotic thing they have ever done. Patriotic for both their homelands: Israel and America. (New Orleans) named Sanchez who’s always been taught to love Israel. Isn’t most of what you write about also written in the OT as God called the Jews “a stiff necked people” and didn’t follow his commands and therefore (in one incident) he allowed the Babylonians to conquer the Jews and make them slaves as well as scattered them throughout the Babylonian lands? Isn’t that what is currently happening now and soon they will be heading for another horrific disaster. It’s just God’s plan, and there is nothing we can do or say about it because it’s Gods plan? Anyway, I’m just thinking out loud I guess…. It’s the same reason they walked away from God so many times and have done so again. Their day is coming when every knee shall bow. They are blinded by evil and the democrat party is as evil as evil gets. They are poised to be even eviler than the Nazi party was. Bravo! Excellent. Makes perfect sense. You have answered a question that has been on my mind for years. Not even my idol, Dennis Prager, has been able to succinctly explain the socio-political-economic-religious roots as to why most American Jews are democrats. I’ll be saving this article for future reference. You have done a great service. Thanks for the enlightenment! Lot of dancing around in this article. The lost American Jews hate Israel because it is becoming more Jewish, showing up their lack of a connection to the Jewish people. And a significant part of the 70% percent are halachically mamzerim. Not sure that there is dancing around, but I would agree with your first point. Thank you! Great article. American Jews hate Republicans and they hate gun rights for citizens of the USA. Perplexing and at the same time very sad given how smart people can have such a huge blind spot. Comments on the site are moderated, so sometimes it takes a couple of hours. But we disallow only very blatantly offensive style, not content. We believe in free speech, but also in the use of appropriate language and polite discourse. Its amazing to think that American Jews would vote for a Democrat. The Democrats want to take away the guns in America. Didn’t Hitler take the guns from the people in Germany when he rose to power? Seems like the American Jews need to bone up on history a bit. Yes, you are exactly right. Thank you for the comment. Excellent article Mr. Pletner! You packed two centuries of history in an article and provided a clear explanation of this issue to someone like me, who even knowing that there was a significant the difference between American JINOs and Israeli Jews, never understood why or where it came from. As you mention in your article, Western European Jews tried hard not to identify with their Eastern European brethren, but neither the Nazis, nor the Communists cared much for the difference. This statement is of monumental importance in a World where globalism has been opening the gates to hordes of African and Muslim immigrants into Europe for what has become a de-facto invasion. I see ethnic Europeans facing a similar predicament Western Europeans Jews faced, only in this case not to Nazism or Communism, but to Islam. Thank you! I certainly agree with your comment. Thank you for the clarity! This has long puzzled me and my husband (whose father was Jewish), but now, put in context, makes perfect sense. Thank you for reading. So happy you liked it! The article does , indeed, clarify the devisiveness between Israeli Jewry and American Jewry (light). It doesn’, however delve into the Khazarian Jewry of the likes of George Soros. In my book Soros hates ALL Jews having led Hungarian Jews to Hitler’s death camps. How can there be such hatred between two camps of the same religion that mass purges would take place, as in the Shiite and Sunni sects in Islam? Stupid is as stupid does. A quick look at most religions show a split somewhere in their history in a bid to become the predominant power in that belief system. Religion always seems to be at the root for wars throughout history. Seems to be the way of the human experience, to me. This article does answer the questions I had about the divisions within the Jewish faith, and why a Jew like Soros would help to execute millions of his fellow believers. They just happened to be the wrong brand of the faith, much like the difference between the sects in islam which causes untold amounts of death and destruction in the world. And has, since islam’s founding. What a waste of human treasure in all cases. Most Jews, like most Christians, don’t understand the Word of God, and most Muslims don’t understand the Quran, because all continue to bicker and fight among themselves concerning “God’s Chosen People” or “God’s Chosen Book” or “Whatever”, and few seem to understand that The Almighty is the father of us all, just as written in Psalm 82:6, and Jesus referred to that passage in John 10:34. Why is it so necessary for “gods” to fight and hate and even kill one another? The answer is simple, but few understand it, because most humans are so carnally minded, Romans 8:6, and have no knowledge of the good, but they have great knowledge of the evil, just like the Jews of the OT, and just as written is Jeremiah 4:22, and most souls are being starved of spirituality, because we, as carnal beings, think too small and only see that which appears before our carnal eyes, and most are truly blind to spirituality, and there’s not much you can do for them, just as Jesus said, in Matthew 15:14. Any knowledgeable “Jew” should understand that a Jew is not a Jew outwardly, but inwardly, just as Paul wrote in Romans 2:28, and which Jesus had already proclaimed in Matthew 23:28, and Mr. Pletner, as a “Hebrew” speaking Jew, should understand why the Jews couldn’t recognize the Son of God, and if he understood his own “Hebrew” Aleph-Bet, he would know that two letters are completely silent, and those letters are Aleph and Ayin, and both have a meaning in “Hebrew”, which is precisely why “God’s Knowledge” was silent to the “Jews”, and remains silent to most of them. I wasn’t born in Israel, and I know little about my heritage and genealogy, but I know that I am a spiritual Jew, because I am a dog, a Hebrew Caleb, who follows His Master, unlike the dogs who return to their own vomit, just as Peter wrote, in 2Peter 2:22, when referring to Proverbs 26:11. The name “Caleb” is a great study, because only he and Joshua gave a good land report to Moses, and most wanted to return to Egypt, Numbers 14:4-8, and in Numbers 13:6, the name “Caleb” is spelled Kaf-lamed-bet, just as the “dog” is in Exodus 11:7, but in Proverbs 26:11, the word dog is spelled Kaf-kaf-lamed-bet, because, as a dog/Caleb, we must receive and accept God, and God is a spirit, just as Jesus told us, in John 4:24, and He cannot be contained by mere humans, just as Solomon, the wisest man in the OT, wrote in 1Kings 8:27 and 2Chronicles 6:18. We, as humans, have much to learn. I agree with most of the article, and commend the author for bringing it forth. I would however, like to raise a few points. The issue of the Bolshevik Revolution and Jewish involvement was entirely neglected. Solzhenitsyn was widely read and taught in this country until “200 Years Together” started to get traction, at which point Jewish power was wielded to get him labeled an antisemite and “The Gulag Archipelago” was for all intents lost to history. The communist Jews of Frankfurt were a treasonous enemy of German society, and did an enormous disservice to the innocent Jews left behind as they escaped to the safety of New York in the 30’s. Also, to label Israel as exclusively Orthodox, parochial and regressive is to ignore the fact that Tel Aviv hosts one of the largest, if not the largest, gay Pride festival in the world, with over a quarter million attending according to the Boston Globe. Which brings me to my last point. I was raised to support Israel, and the New Testament commends me in continuing to do so. So I learned the story of Herzl and his indifference to God, and how they came about to reject the menorah and the shofar on the flag of their fledgling nation. It was with much disappointment that I learned the hexagram was not uniquely Jewish, the Seal of Solomon being the much more accurate Jewish description of this occult geometry. It may indeed be the Star of Rephan (Saturn) that got Steven killed in the Book of Acts. Israel needs to be supported, it is true, but with eyes open. The perfidy of globalist Jews is another issue entirely. I found the article very insightful and it answered a nagging question I have had for a long time why many Jews live conservative lives yet support the greatest threat to our republic and way of life – the Democrat Party. It is hoped that many, Jews and Christians alike, will come to realize the Democrat Party is friend to no one except to the Party itself. Kudos to this author who has now enlightened me as to the origins of the “self-hating” Jewry, which seems to infest the socialist swamps of America. Names such as Soros and Sanders come to mind. I love the explanation and the deep-dive into their motivations. I hope that things are changing and the 30 / 70 ratio becomes flipped in favor of the Republican party. We are working on the blacks with some success and the hispanic support for Republicans is growing. Very well written article. I would look forward to your thoughts on how the old Jewish Defense League fits into your view of Jews in America today. I was under the impression that many pro-gun and pro-Israel Jews left the USA and are now in Israel. Don’t understand why a sane Jew would vote for or be a member of the dhimmi-rat party. Gun control worked very well for those who effected the murder of European Jews, now they want the same in the US. Confiscation = extermination. Genesis 12:3. Thank you for the article. Now can you explain to me, the reason for antisemitism? I don’t understand where the hate comes from or the reason for it? I’m not Jewish myself but this subject of antisemitism has always confused me. He just got done explaining that 70% of jews are Democrats, the creatures who flood America and Europe with corruption, degeneracy, and foreign invaders, and the other 30% created an ethnostate from land stolen from Arabs and from treasure stolen from Americans and Europeans. There isn’t a single reason to be pro-semite. Also, the article is a load of pilpul garbage. Every jewish Democrat in government holds dual citizenship and continually votes to supply Israel with the produce of Americans. The very first bill up for vote after the government shutdown ended was an attack on the 1st Amendment in favor of Israel. This so-called “anti-Israel” farce is the exact same sort of kabuki theater show that “Republican vs Democrat” has been for decades. They all play for the same team, team make jews wealthy at the expense of goys. Agreed. Stupidity such as that is best aired out & fairly judged Mr. Pletner. Spot on Mr. Pletner. My Jewish American friends have always been a perplexing puzzle to me for their dislike of Israel and (in their minds) mis-treatment of the Palestinians. Now it makes perfect sense to me. I have long admired the Israelis for their strength, tenacity, creativity and success, how can you argue with winners. They have shown the world that they have what it takes to survive, especially in a world where so many hate them based on what? Their love of freedom, family, and independence?I say God has blessed the nation of Israel and evil has overtaken the American democrats, and since God can’t stand evil, their day of reckoning is fast approaching. I hope our Jewish American friends will soon see the light. Superb article Dr. Pletner! There are many excellent points that you made. Thank you for not apologizing for Zionism, which simply harkens back to the biblical tower of Babel where God created the nation states! I am of the opinion that the whole globalist drivel is a rebellion against this. On a personal note, I stem from the Rubelman vintage. At sometime in the past my relatives became Protestant, perhaps for pragmatic reasons, I really don’t know, but am glad they did. I am assuming you have read the New Testament (a very Jewish book). Have you compared Isaiah 53 and Psalm 22 with the gospel of Matthew (written by a Jew for Jews)? I highly recommend it! Thank you again for your cogent insights. I pray for the peace of Jerusalem! It’s ok. We as Christians will continue to nurture, pray for, and support the dem Jews. They are stiffed necked, blinded, and in political things ignorant. They didn’t believe their own prophets many times, and they did not believe Jesus either. However, the gentile was blessed through Israel, and will continue to be so. Thank you for your article. The day of return draws near. A decent, well-crafted and insightful article. Bravo! A very insightful & intelligent take on a nagging question, and as someone noted: even Dennis Prager wrestles with the problem. Other than the “from/form” typos (I haven’t a proof-reader either) PERFECT! Really appreciated the article. But I wished their was more information about how exactly the Jewish elite started to hate the non-Jewish elite, back in the day. Can you give any more information than that the elites simply didn’t like the non-elites vocations? That’s an interesting question. I think it was similar to how today’s American elites view the so-called “deplorables”. A Jewish lawyer from Vienna saw a Jewish tailor or innkeeper from some shithole little town in Poland as too religious, uneducated, clinging to old ways of dress and speech. The elites knew that they come from the same place, but wanted to pretend that they had nothing inc common with it, kind of like a boy from WV who went to Harvard and now lives in Boston may feel about the town where he grew up. Thank you for an interesting opinion piece. As a lifelong Catholic, I have been a devoted proponent and supporter of Zionism and Eretz Israel. For me, this started with the obvious connection with Jesus as a Jew, but expanded when I lived in Bavaria and had the opportunity to visit the Dachau concentration camp and other former areas of Nazism. I followed this up with other visits and to a half dozen Shoah museums. I support Israel and wholeheartedly believe in their biblical claim to the land and to the original covenant with God. Moreover, I believe that the shameful MS St. Louis incident was not one of the US’s finest hours. I’d like to make 2 points, however. First, in your piece you mentioned Breitbart reporting “Obama’s anti-Israeli ardor was cooled somewhat by Jewish donors.” It may be factually correct that the outlet wrote that, however, they did not “report” it in the traditional sense because the publication is more akin to a supermarket tabloid publishing half-truths and outright falsehoods than to an actual media outlet that investigates and vets their information. The inclusion of them as a reference in your piece could tend to be a turn0ff to a larger audience as Breitbart is viewed by many as an ultra-right (possibly alt-right) propaganda organ. Second, though many Christians support the Republican party, and by extension Israel, it would seem that some do so for a selfish reason, namely the prophecy of the latter days and the second coming of Christ. Though there is nothing inherently wrong with that, such Christian support does not necessarily translate to support of the Israeli people and their brand, but rather support of how a new Israel helps those Christian attain their own goals. Thank you. Thank you for your informative article about this apparent split within the World Jewish community! It answers many of my own questions about Jews seemingly turning their backs on Israel. Per one of your points, it deliberately ignores the history of Jewish persecution over the past ~2700+ years. I hope that & much more changes. Btw, i am a gentile Christian (Jesus follower) with no Jewish heritage. 1. The consistent history of persecution against Jews makes no logical sense. Therefore imo, there must be a greater ongoing spiritual struggle with evil. God’s promises (warnings too) to Abraham & all Jews stands today regardless, if Jews & Gentiles accept it or not. 2. I am a very imperfect but redeemed Jesus follower & imo there is Biblical significance to a Jewish Nation being re-established. I support Israel & will continue to, not that i agree that Jews or Israel always get it right…nobody gets it right all the time. I will never support the massacre of anyone, including Jews. The present anti-Jewish dogma is growing in its acceptance & violent rhetoric. 3. After the Jewish-Roman wars & the depopulation of Judea/Israel, the Byzantine Empire repopulated it with Greek Orthodox Christians. There were Arabs too, but not many until the 1st Muslim Crusade around 700 AD, & still a minority. Some of these Greeks did convert to Islam, but again they were resettled there around 300-400 AD. Therefore this 4000+ year old Palestinian dogma is nonsense. There was more Arab migration much later. o The Roman Empire, representing a wider Gentile world, actually sentenced Jesus & carried out the execution. Therefore any Gentile bears equal responsibility for Jesus’ death. o People want to claim that Jesus was just a moral teacher. He actually claimed to be the Son of God & One with God (the Father). He was either what He claimed, evil, or delusional. If He was not the Son of God, the Old Testament Law prescibed death, for making those claims. So a decision has to be made about Jesus, imo. o Every Passover/Easter Season i reflect on how i would have called for Jesus’ crucifixion per my past unbelief & constant spiritual struggles today. I am completely unworthy of His forgiving Mercy in my life. o Jews have been the recipients of unwarranted persecution & also gifts/blessings in many fields when allowed freedom, as seen over the last 300+ years. I hope you Keep informing us, Mr Pletner! Thank you again!